On Sunday, one of our pastors noted that this was the second week of the new year; yes, Christians should live in the rhythm of a Christian sense of time, meaning that the church calender is more formative than the one of our culture. So we are only a few weeks into this, and it isn’t too late to be faithful and fruitful in explore the deeper meaning of this season. (And, as my practical wife says, it is wise to have one ready for next year, since this season does sneak up on us rather quickly each year, eh?) Good advice! Here are a few we thought you’d like to read about. Feel free to post other suggestions in the comments sections for other readers to consider. There are so many great resources on the internet, and I hesitate to single one out. Our friend Christine Sine, whose book Godspace: Time for Peace in the Rhythms of Life [Barclay Books; $14.00] is a wonderfully useful ally in thinking about the rhythms of life, sabbath lifestyles, daily spirituality, missional living and rest (etc. etc.) has a collabartive blog that offers short meditations and is a lovely place for Advent reflection. Visit the GodSpace blog here. Make sure you search out her Advent videos that she does each year. Receiving The Day: Christian Practices for Opening the Gift of Time Dorothy C. Bass (Jossey-Bass) This book was a great grace to me, a beautiful reading experience, coming as it did, years ago, now, around the time of the unexpected death of my father. The solace it brings thinking about having read it, even now, is extraordinary. I am not alone in observing what a wonderfully-written and profound work this is. It is about sabbath and rest, of course, but more, a deeply religious view of time, of the passing of the seasons, of indwelling God’s time. Very, very nice. The Liturgical Year: The Spiraling Adventure of the Spiritual Life Joan Chittister (Nelson) $17.99 I wrote about this in our last post, but thought it bore repeating. Skip back a post if you didn’t read our little annotation there about Sister Chittister’s new one. Lovely and informative. Living the Christian Year: Time to Inhabit the Story of God Bobby Gross (IVP) $17.00 I described this in the blog, and our small connection to it, when it came out in August. You will be hearing me talk about it more this Spring as we are hosting the author for an autographing party in May. It will be on Ascension Day (a very important day, theologically speaking) so it won’t be just an author reception: we will worship and pray and learn and celebrate. This solid book is an introduction to the church calender for those who are seasoned (nice pun, eh?) or those just considering this sort of way of thinking about time and discipleship. It really is a devotional, so anyone looking for a year-long daily devotional would be wise to pick this up. Endorsements range from Phyllis Tickle to Luci Shaw to Mark Labberton. Lauren Winner wrote a fabulous forward. Highly recommended. 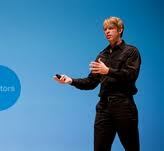 Here is a nice interview with the author to get a flavor of story. Signs & Seasons: A Guide for Your Christian Journey Graham Kings (Canterbury Press) 22.99 this may seem a tad pricey—it is a British import—but as N.T. Wright says in the forward , it will “open the imagination to glimpses of glory.” A very nice overview written by a vibrant Anglican pastor. There is some full color art included, and some interesting graphics and illustrations. Check out www.signandseasons.co.uk to join a conversation. The intriguing cover art, by the way, is an Indonesian batik by Aryo Kuswadji. The Advent of Justice: A Book of Meditations Brian Walsh, Richard Middleton, Mark Vander Vennen, Sylvia Keesmaat (Dordt College Press) $6.95 I cannot tell you how many times I’ve read this and I do not tire of these rich, radical, insightful, politically-charged, Biblically faithful studies of the famous Advent texts, to be read one a day. We have said this is the most important Advent book we’ve seen and I still think that is true. The authors are all amonst the best Bible scholars we know and—interestingly, this isnt always the case—we can vouch that they live what they write about, that their insights into the Scriptures, a Christian worldview, and the invitation to subversive loyality to the restoring reign of Christ, have come from years of working this stuff out. Has some very evocative illustrations, a bit of art, making it a great little book for a great price. Songs in Waiting: Spiritual Reflections on Christ’s Birth—A Celebration of Middle Eastern Canticles Paul-Gordon Chandler (Morehouse) $20.00 This small hardback, with some allusive contemporary artwork, is doubtlessly my favorite Advent devotional released this year. I’ve read two other books by this young writer and minister who grew up in Senegal and has a great heart for global faith, and working with Muslims, especially. Here, he brings his Northern African eye to four famous Biblical songs—the Song of Mary, the Song of Zechariah, the Song of the Angels, and the Song of Simeon. That is, the Annunciation, the Benedictus, the Gloria, and the Nunc Dimittis. With the paintings by Daniel Bonnell, this is a splendid, rich, and helpful guide into the songs of the Story. The Christ of Christmas James Montgomery Boice (P&R) $11.99 This was published in the early ’80s and was a staple in our Advent displays of Christmas past. And why not? Dr. Boice was one of the all time great American preachers, an exegete and Reformed, expository teacher. Here, he offers solid sermons that move beyond sentiment, stick to the standard proclaimation of the of the gospel of grace, offering deep and solid insights in ways that one recent reviewer says will “dazzle the reader.” Thank God for such sermons—16 included here— to ponder and enjoy and share. l us this is their favorite advent collection. It was initially compiled by the innovative and ecumenical minds of the Pennsylvania Bruderhof community (then running a small publishing ministry called Plough Press.) Here you have profound and at times luminous excerpts from the likes of John Donne and Annie Dillard, Martin Luther and Thomas Aquinas, Philip Yancey and Thomas Merton, C.S. Lewis and Dietrich Bonhoeffer, T.S. Eliot and Dorothy Day, and so many more…. I am confident there is no richer volume of this kind in print. Later, you’ll want to purchase the Lenten companion volume, Bread and Wine. 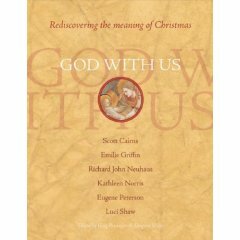 God With Us: Rediscovering the Meaning of Christmas edited by Greg Pennoyer & Gregory Wolfe (Paraclete) $29.95 If the previous one had as a great strength the diversity of authors, theological and literary, enough to talk you to Epiphany in early January, this one has as its great strength two wonderful features: the stunning, wonderfully reproduced serious artwork through-out and the quality of the four authors who offer five great chapters. (Five, of course, because they wisely include the week between Christmas and Epiphany.) This is printed on high-quality glossy paper making it a glorious gift, a fabulous book to behold. Thanks to all involved as selling this is one of our staff’s great joys of the season. The authors include Scott Cairns, Emilie Griffin, the late Richard John Neuhaus, Kathleen Norris, and Luci Shaw. There is a nice forward by Eugene Peterson and an interesting appendix about Epiphany dates. My oh my, this is a great treasure.